The Villamarina Hotel in Salou is situated just a 10 minute walk away from the main beach, however this short walk is well worth it when you see the beautiful promenade and beach. The beaches of Salou are without a doubt the resort’s main attraction. The fine, golden sand, the clear, shallow waters – the sheer beauty- have captivated, and are still captivating, visitors from far and wide. Salou coastline is varied. Wide expanses of golden sand blend in with beachfront hotels and residences, while other more intimate beaches are sheltered by pine trees and pretty inlets and coves. Salou has got eight different beaches. This is longest and the most popular beach in the resort of Salou 1200 metres long and 140 metres wide. It goes from the harbour (Club Naútico Salou) on the west, to a place known as the “cliffs” on the east. During the summer, an area is set aside for several sport activities. In the old days, when mixed bathing was not allowed, this was known as the “men’s beach”. 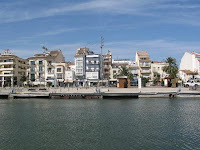 In the summer there are dancing musical fountains on the promenade of this beach which are well worth the visit, with the Villamarina Club out of all the hotels in Salou been one of the closet to this spectacular attraction. This is more than one kilometre long. This beach goes from Cambrils to Salou’s harbour. This was known as the “ladies beach”. This is a little beach in the centre of Salou. 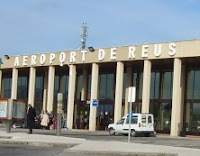 It’s 220 metres long and can be reached from Brussels street. It edge is on the cliffs. 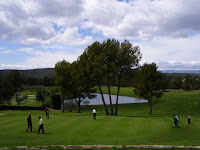 It is surrounded by pine trees and nature. It is 600 metres long and you can reach it on foot by Replanells street, close by the road to La Pineda. This a very beautiful beach. The Villamarina Hotel in Salou offer all inclusive holidays in a family friendly atmosphere, with easy acces to main attractions in Salou. We would like to take this opportunity to thank everyone who choose the Hotel Villamarina Club out of all the hotels in Salou as their summer 2009 holiday destination here in the Costa Dorada, and we hope that you enjoyed your stay here with us. The Villamarina Club endeavors to improve its all inclusive facilities year on year and we will be looking at ensuring 2010 is even better out of all the hotels in Salou we aim to be the number 1 all inclusive hotel in the Costa Dorada. For now we are left with the great memories of the Villamarina and Salou for 2009, we have had parties, great shows, bucking bronco, terror tunnel and much more, along with you fantastic customers, staff and weather. Thank you once again and hope to see you here for your family holiday in Summer 2010. Keep yourself up to date with all news and events taking place out of all the hotels in Salou the Villamarina will ensure you come first and that your opinion counts. Keep updated on our Facebook page for offer, news and friendship. Sweepstake coming soon for a free 4 night stay in April on Facebook. 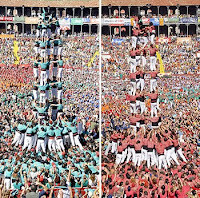 Catalunya in Miniature - Be bigger than Barcelona ! This is a unique different way to see all the sights of Barcelona and Catalunya whilst staying at the Villa Marina. Catalunya in Miniature is the worlds largest tourist and cultural complex in miniature in the world, and the only one in Spain. lets the visitors know the monuments, buildings and the most representative achievements of the Princedom. This is the ideal day out for all the family having everything close to hand and within easy walking distance. Catalunya in Miniature gives you the history and the education on the area without having to walk too far. The easiest way to get to Catalunya in Minature from the Villa Marina would be by means of a hire car or the train in to Barcelona then a public bus. 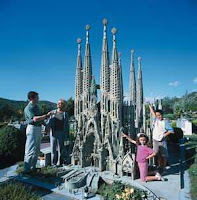 The majority of customers who stay in the Villa Marina are traveling with children and will find that by visitng Catalunya in Minature it is a more relaxing experience then travelling around Barcelona city to see all the sights. Fancy coming to the Villa Marina in salou but want to visit Barcelona?, The best and most independent way to do this is by utilizing the Barcelona City Hop-on Hop-off Tour which has three different tour routes to explore the city! See the major sights aboard an open-top double-decker bus, and with over 44 stops to choose from. You decide where to hop on and hop off around the city depending on which attraction / sight you want to visit. Spend as much or as little time at places of interest before jumping aboard for the next stop - the choice is yours! You are given a printed information guide about each stop when you buy your ticket as well as a discount voucher for entrance to museums and main sights which is always a bonus. You can hop-on and off as many times as you like at any of the 44 stops. Tickets cost approx 20 euros for 1 day and 26 euros for 2 days , childrens (4-12) 12 and 16 euros. The easiest access to get to Barcelona from the Villa Marina hotel would be by train. Train takes 1.30 mins and costs 12 euros return. 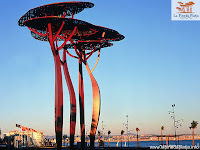 The train station is a 5 min walk away from the Villa Marina Hotel. 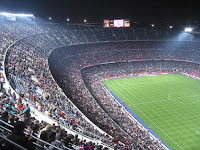 If you are not confident if going to Barcelona independently, then ask your representative for organised trips. Majority of people say by doing this independently you get to see a lot more of Barcelona, and specifically you choose what you do and do not want to visit. From 29th September to 18th November Port Aventura celebrates its most terrifying days during Halloween. They will make your worst nightmares come true. During Halloween in Port Aventura you will find terrifying surprises hidden in the forest, walking along the streets or when eating in some of the restaurants. In the gift shops you can buy anything you need to keep celebrating Halloween at home. Not everything will be scary during these days. The little ones will still enjoy their favourite characters with the big Halloween pumpkins or visiting their small houses full of sweets and playing "trick or treat". 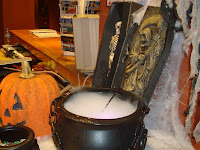 Halloween is one of the most popular celebrations at Port Aventura, it is an event not to be missed. Port Aventura opens daily from 29th September to 4th November and the days 10th, 11th, 17th and 18th November. Opening times are from Monday to Friday from 10 am to 7 pm, Saturdays from 10 am to 12 am (except 10th and 17th November from 10am to 9pm) and Sundays from 10 am to 9 pm. The ticket price for these days is 37,00 € per adult and 29,00 € per children (from 4 until 10 years, less than 4 years its free), you can buy it at the Hotel Villamarina Club reception. Unless you want to miss this big event please make your booking at the Hotel Villamarina Club between the 4th and 18th October (last vacancies) or at Festival Village between the 29th September and the 4th November.